With up to 90,000 bonus Velocity frequent flyer points currently on offer with the Virgin Australia Velocity High Flyer credit card – plus a further 9,000 points earned by meeting the offer criteria – eligible new customers can soar to new heights by spending their fresh haul of frequent flyer points wisely. Whether it’s taking a return overseas trip in business class or escaping economy with up to 20 flight upgrades, here are just some of the great ways to spend 99,000 Velocity points, and how you can earn them from spending beyond Virgin Money’s current sign-up deal. Simply put, eligible new Virgin Australia Velocity High Flyer credit card holders can earn up to 90,000 bonus Velocity points over a three-month period, when applying for the card by April 30 2019 and meeting the card’s spending criteria over the first three months. Served in three chunks, it starts with 30,000 bonus Velocity points when you spend $3,000 or more on eligible purchases in the first month, followed by a further 30,000 bonus Velocity points when you spend $3,000 on eligible purchases again in the second month. Fast forward to month three, and a final monthly spend of $3,000 delivers the final serving of 30,000 bonus points: up to 90,000 bonus Velocity points in total, following a total overall card spend of at least $9,000 (min. $3,000 per month). There’s a $289 annual fee to pay – which doesn’t count towards that $3,000/month requirement – but in addition to the bonus points awarded, cardholders can also earn one Velocity point per $1 spent on eligible purchases up to $8,000 per month, and 0.5/$1 thereafter. That translates into at least 9,000 further Velocity points heading your way just by meeting that spending criteria, for an all-out total of 99,000 Velocity points: so here are just some of the things you could do with them. When travelling on short Virgin Australia flights like Sydney-Melbourne on a flexible economy Freedom airfare, just 4,900 Velocity points can have you bumped up to business class: and with 99,000 Velocity points to spend, you could do that 20 times and still have points leftover. That’s 20 pre-flight visits to the Virgin Australia lounge – plus another 20 lounge visits after your flight if you’re so inclined and there’s a lounge available – or a still-reasonable nine business class upgrades when flying on the lower-priced Elevate and Getaway fares. Travelling coast-to-coast on Virgin Australia’s flights between Perth and Sydney, Melbourne or Brisbane? With one-way business class upgrades costing 9,900 Velocity points when booked on a Freedom fare, your bounty could instead unlock 10 upgrades on these long domestic flights. That includes Airbus A330 flights with The Business – promising an international-grade fully-flat bed and direct aisle access at the pointy end – although on these cross-country routes, upgrades from other fare types require significantly more points, making them less appealing. Want to put your points towards a getaway with your partner? A starting balance of 99,000 Velocity points is enough to secure round-trip business class tickets for two people on mid-length domestic fligths and some VIrgin Australia international routes. Among your many options, flights from Sydney to Adelaide, Melbourne to Brisbane and Brisbane to Port Vila (Vanuatu) all come under this umbrella, and are yours for 23,500 Velocity points per person, one-way: 94,000 points in total, keeping 5,000 Velocity points up your sleeve. 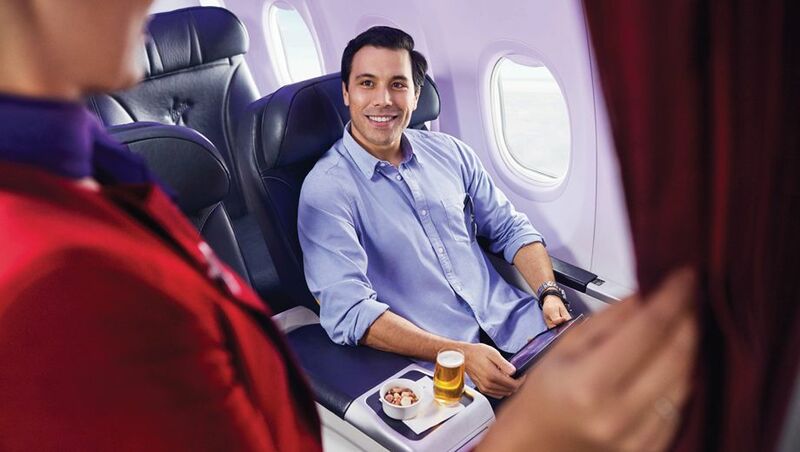 Virgin Australia’s partner Hawaiian Airlines offers non-stop flights between Brisbane and Honolulu, which you could book with your Velocity points – flying business class in one direction (65,000 points) and economy the other way (35,000 points), for 90,000 Velocity points all up. Hawaiian Airlines also flies to Sydney, but those flights are a little longer and require more points: and with 99,000 to spend, you’d fork over 84,000 just for a round-trip economy ticket, so flying out of Brisbane may be preferable even if you travel domestically on a separate, paid airfare. Los Angeles is also within reach from Sydney, Melbourne and Brisbane with Virgin Australia – and with Delta out of Sydney – clocking in at 89,600 points for a return economy ticket or 95,500 points for a one-way business class flight. Denpasar (Bali) is an incredibly popular destination with Australian travellers, and the number of points needed to fly there adds extra appeal, given Indonesia is reasonably close to home and shorter-distance flights command fewer points to secure. Flying from Sydney, Melbourne or Brisbane, you’d part with exactly 99,000 Velocity points for a round-trip journey in business class, putting every single point earned from your credit card to use. To compare, you’d need a higher 119,000 Velocity points for a return business class jaunt from Sydney or Melbourne to Hong Kong, or 130,000 points from the east coast return to Singapore with Singapore Airlines, whereas Bali flights clock in at just under six figures. If your travels are already taking you to London, it could be the perfect opportunity to use some annual leave for a side trip to New York (or vice versa), taking advantage of your location to enjoy a mini holiday before returning home. Travelling aboard Virgin Atlantic – Virgin Australia’s sister airline – you could fly round trip in ‘Upper Class’ (business class) for exactly 99,000 Virgin Australia Velocity points, including access to Virgin Atlantic’s legendary Clubhouse lounges before the flight, and the Revivals Lounge for breakfast and a spa treatment after you land in London. As with Hawaiian Airlines, you’ll need to call Velocity to book Virgin Atlantic flights, and as always, taxes, fees and charges are payable when redeeming Velocity points on outright bookings, with amounts varying from flight to flight. With all of the cuts on Krisflyer in the past few months (devalued exchange rate with Velocity, increase on miles needed for SQ bookings, and most recently, increase on miles for partner flights), I'd only convert to Krisflyer these days as a topup if I needed a few more miles to make a booking, unless I really couldn't burn them through Velocity. Thanks for tip regarding booking Hawaiian Airlines flights over the phone (ie. tip#3 in the article). I'd previously been using the Virgin website for frequent flyer redemption searches on this route and thought it odd that there was never any availability. Will pickup the phone next time. Cheers. Partner airline availability is appalling. Got 600k points that I don't know what to do with currently. Comment on "What can you do with 99,000 Velocity points from Virgin Money?"